Topeka&apos;s annual Tulip Time Festival, recently recognized by the American Bus Association as one of the nation&apos;s Top 100 Event for Groups, began earlier than anticipated this year because of early blooming. A day of activities and fun at Ted Ensley Gardens will be a celebration of spring. "Enjoy Tulip Time now and come back to the Ted Ensley Gardens on April 17," said Rosa Cavazos, Visit Topeka&apos;s director of tourism development and the organizer of the Tulip Time Festival Day at the Lake. 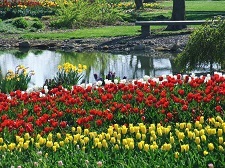 "The gardens and Lake Shawnee are beautiful even after the tulips have bloomed. The festival is a day to get out and experience that beauty." There are more than 120,000 tulips and daffodils in bloom during Tulip Time. Enjoy them at Lake Shawnee&apos;s Ted Ensley Botanical Gardens, at Old Prairie Town at the Ward-Meade Historic Site, at Gage Park and in Downtown Topeka.